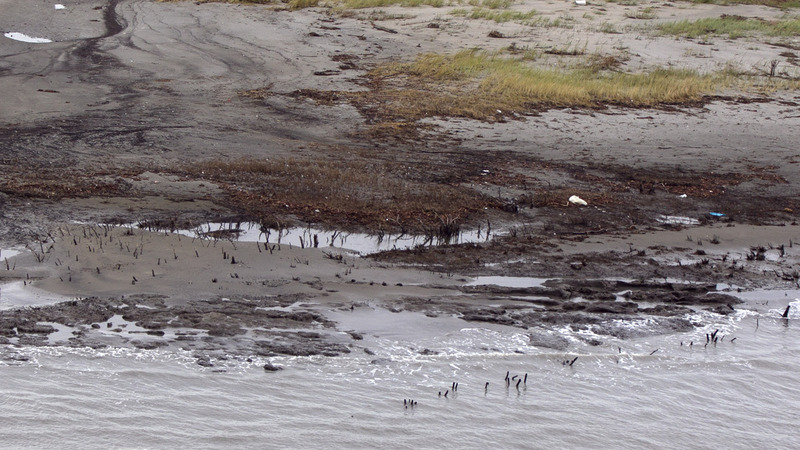 BP Ends Oil Spill Cleanup In Gulf, Except For Louisiana : The Two-Way The Coast Guard will be responsible for any reports of residual oil in areas outside BP's Louisiana patrol zone along the Gulf Coast. There's no end in sight for BP's cleanup efforts in Louisiana, a Coast Guard officer says. BP is scaling back its cleanup efforts from the Deepwater Horizon oilspill in areas outside Louisiana. Here, a photo from last September shows alluvial clay and tar mats on the shore of Elmer's Island, in Jefferson Parish, La. BP is ending its cleanup of the massive Deepwater Horizon oil spill in three Gulf Coast states this month, leaving Louisiana as the only state with ongoing cleanup linked to the company's Deepwater Horizon Response effort. Reports of oil sightings in Alabama, Mississippi, and Florida will soon be the U.S. Coast Guard's responsibility to investigate. "It's been three years since BP's blown-out well spewed more than 4 million barrels of oil into the Gulf of Mexico, but tar balls and other forms of residual oil continue to foul marshes and beaches in the region. "BP will remain responsible for patrolling about 85 coastal miles in Louisiana." Any reports of residual oil or other pollutants in areas outside BP's Louisiana patrol zone will be sent to the National Response Center, officials say. Reports of pollutants in the Gulf will soon go to the Coast Guard, which will use "sampling, fingerprinting and other investigative means to identify the source of the pollution and find the responsible party," according to a news release by the Deepwater Horizon Response team. "If oil is found to be MC252 oil [the designation of oil from the Deepwater spill], BP will be held accountable for the cleanup." In New Orleans, The Times-Picayune reports that more than 100 Coast Guard and contract employees remain on the job of cleaning up Louisiana's waters, marshes, and beaches. The newspaper says "there's still no time frame for the end of response efforts in Louisiana," citing a Coast Guard Lieut. Cmdr. Natalie Murphy. The transition is expected to be complete by the beginning of July.